By way of explanation, the paper applauded Teachout for energizing “her audiences with humor and biting criticism of the governor’s ethical failings”; for denouncing Cuomo’s “tax breaks for the rich”; and for calling out his multiple failures to reform campaign finance, fix gerrymandered congressional districts, and pass laws protecting women’s equality. The paper noted, favorably, that Teachout described the incumbent governor as part of a “broken system” in which “public servants just end up serving the wealthy.” That is about as close to a full-throated endorsement as you can get without actually getting one. 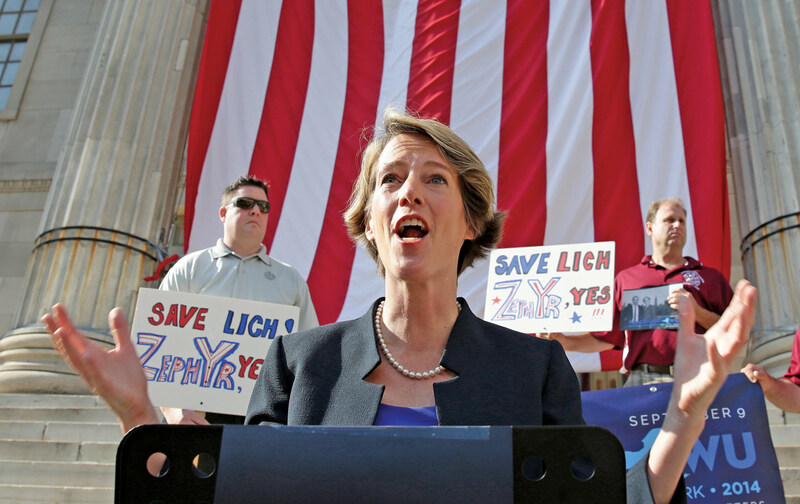 In the wake of her defeat, Teachout hasn’t shown any signs of fading into the background. She has traveled tirelessly across New York State in recent months, finding converts wherever she brings her upbeat message. She was a big hit during recent appearances on two popular late-night Comedy Central shows, and the book she’s been promoting, Corruption in America: From Benjamin Franklin’s Snuff Box to Citizens United, has generated significant media coverage and critical acclaim. It all adds up to the conclusion that we’ll likely be hearing a lot more about Zephyr Teachout in the future. Cuomo faces his own risk of getting snared in Bharara’s web. Glenwood Management, the real-estate developer that emerged as a central figure in both indictments, appears to have traded millions of dollars in contributions to Silver, Skelos, and Cuomo for easy access to them and favorable legislation on tax breaks. Glenwood and its various affiliates spent nearly $1.5 million to help re-elect Cuomo in 2014, making the developer one of the governor’s largest donors. Teachout, 43, comes by her progressive instincts naturally. She was born in Seattle but grew up in rural Norwich, Vermont, across the river from Dartmouth College. Her father, Peter, is a constitutional-law professor at Vermont Law School; her mother, Mary Miles Teachout, is a state judge. After receiving her undergraduate degree from Yale, Zephyr headed south to Duke, where she earned both a master’s degree in political science and a law degree and served as editor in chief of the Duke Law Journal. Teachout spent seven years in Durham, North Carolina. After graduating from Duke Law in 1999, she worked as a law clerk for a federal appellate judge and as a staff attorney at the Center for Death Penalty Litigation. She was also the cofounding executive director of the Fair Trial Initiative, which advocates on behalf of capital defendants. “I have a lot of friends down there,” she says of the city. In 2006, she moved to Washington, DC, to serve as the first national director of the pro-transparency Sunlight Foundation. She has also been a lecturer at the University of Vermont and a nonresident fellow at the Berkman Center at Harvard Law School. Still, Teachout knows from experience that politics can be a tough business. “You don’t own your own reputation,” she observes. “You have to give that up and sort of own giving that up. I’ve been lucky so far, but I don’t anticipate I’ll stay lucky.” She expects to run again for office in New York, although she’s not sure at the moment whether that would mean another run for governor in 2018 (assuming that Cuomo doesn’t run again) or for an office like state attorney general (assuming that the incumbent, Eric Schneiderman, decides to challenge Cuomo). She also wonders about the political aspirations of people like Preet Bharara and Benjamin Lawsky—the state’s first superintendent of financial services, who recently resigned to set up his own consulting business—and what their political aspirations would mean for her own.